The visitor centres of Hossa and Kylmäluoma are located in stages between Kajaani and Kuusamo. The distance between the centres is only about 60 kilometres, so one can also make use of the services of both properties during the same holiday. The distance between Kylmäluoma and Hossa can be broken down through Pistonlehdontie, Peranka intersection, or Julma-Ölkky. 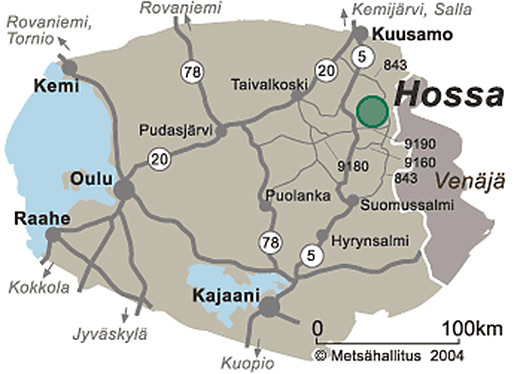 Hossa is located on the eastern border of Finland, in the northern part of the municipality of Suomussalmi. Hossa visitor centre is located in the premises of Hossa nature centre, on the edge of Hossa National Park. Signs direct visitors to the visitor centre from Highway 5 (E63). From Highway 5 (E63), turn at Peranka towards the east to Selkoskyläntie (9190), which will continue for about 25 kilometres. At the end of Selkoskyläntie, turn left onto Hossantie (843), and drive for about 8 kilometres to Hossa nature centre, following the signs. From Jatkosalmentie, drive another 700 meters to the nature centre, where Hossa visitor centre reception is located. When arriving from the north, one can cut out about 20 kilometres, when one turns from Highway 5 onto an earlier Kerontie (843) and continues along the same road (843), all the way to Hossa. One can also reach Hossa by bus during school holidays. The bus stops at the Hossa Holiday Centre. From the stop, the distance along the road to the visitor centre is about 6 kilometres, or, along a path, about 4 km. A bus runs between Kuusamo and Kajaani on Highway 5 (E63). The nearest stop is in Peranka, from which the distance to Hossa is about 30 kilometres. The local taxi service Hossa Taxi is one way to get from the bus stop to the visitor centre. Keen trekkers will also be able to walk along a marked trail. In so far as one arrives by plane, cars can be rented from the closest airports in Kuusamo (80 km) and Kajaani (200 km). The transfer via Kajaani train station (200 km) is the best option. The nearest railway station is located in Kontiomäki (170 km). Favoured by fishermen and hikers, Kylmäluoma is located in the north-eastern part of the municipality of Taivalkoski. Kylmäluoma visitor centre, with its campsites, is surrounded by nature, but easily accessible from Highway 5 (E63), between Kuusamo and Kajaani. Signs will direct drivers from Highway 5 towards the visitor centre about 50 kilometres south of the municipal centre of Kuusamo. From the intersection, the distance to Kylmäluoma visitor centre is 2 kilometres. Those driving along the Oulu-Kuusamo road should turn towards Kylmäluoma at the municipal centre of Taivalkoski. From the municipal centre, drive along Jokijärventie (8400) for 45 kilometres to Highway 5 (E63), from which the journey continues towards Kuusamo for another 10 kilometres. A daily express bus connection runs between Kuusamo and Kajaani along Highway 5. Close by Kylmäluoma, there is a bus stop at the intersection of Pajuluomantie, which is 2 km from the visitor centre. 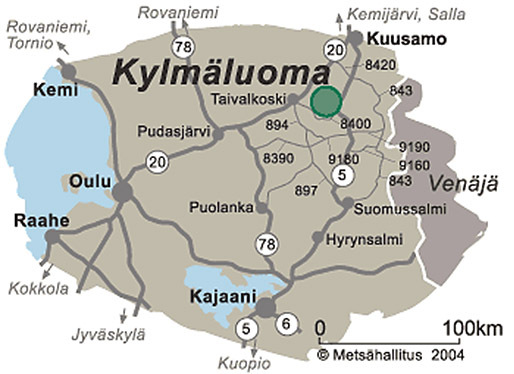 Kylmäluoma also has village taxis, the contact information of which can be provided by the reception at the visitor centre. The closest airport is located in Kuusamo (58 km). Those travelling by train can take advantage of, for example, Kajaani, Oulu or Kontiomäki stations for transfers.